According to Statistics Finland, the housing costs of owner-occupied dwellings increased by 1.7 per cent in the first quarter of 2017 from the respective quarter of 2016. According to preliminary data, the price of buying a dwelling went up by 1.4 per cent from the corresponding period. 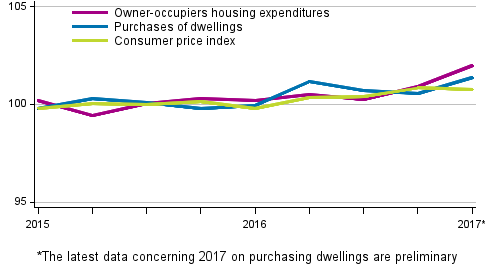 Compared with the previous quarter, the housing costs of owner-occupied dwellings rose by 1.1 per cent and purchasing of dwellings became 0.8 per cent more expensive. The base year for the indices of owner-occupied housing prices has been changed to 2015=100. The renewed price index of old detached houses has been used in the calculation of price indices, for which reason the data of the index series describing purchases of dwellings differ from those published earlier as regards 2015 and 2016. The base year is changed due to Eurostat’s requirement to switch the base years for the indices of owner-occupied housing prices into 2015. ISSN=2341-6971. 1st quarter 2017. Helsinki: Statistics Finland [referred: 25.4.2019].